Chrystia Freeland has been a fixture in the U.S. capital in recent weeks, taking part in high-level NAFTA negotiations with U.S. trade czar Robert Lighthizer and Mexican Economy Minister Ildefonso Guajardo. 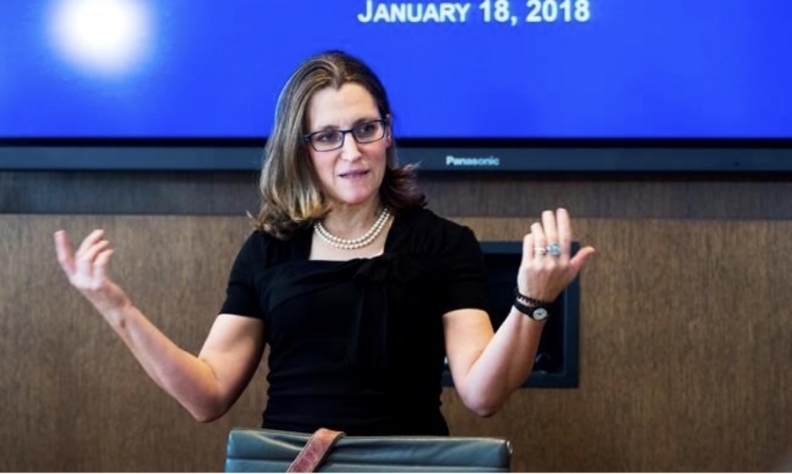 OTTAWA — Canada’s Foreign Affairs Minister Chrystia Freeland will visit Washington this week in another bid to help unblock talks on the North American Free Trade Agreement, a spokesman said on Monday. Talks to modernize the trade deal between Canada, Mexico and the United States hang in the balance. Freeland will be in Washington on Tuesday and Wednesday, said spokesman Adam Austen. The United States, Mexico and Canada are struggling to settle deep differences over what a new NAFTA should look like. “We’ve said all along we are ready to go (to Washington) at any time,” Austen said by phone, but declined to comment when asked about the chances of the three nations sealing an agreement. Meanwhile, Prime Minister Justin Trudeau has been talking by phone with U.S. President Donald Trump and Mexico's Enrique Pena Nieto in recent days despite dwindling hope of reaching a deal. Time is of the essence: Canada's latest reprieve from potentially crippling U.S. tariffs on imports of steel and aluminum expires June 1, and there are fears they could go into effect without a NAFTA deal in place. The clock is ticking south of the United States, too. Mexican Economy Minister Ildefonso Guajardo said last week there was about a 40-percent chance of concluding the NAFTA talks before Mexico’s presidential election on July 1. Guajardo and Freeland have held several rounds of talks with Lighthizer, who says he wants a quick deal to avoid the talks overlapping with campaigning in Mexico. The negotiations are moving slowly as Mexico and Canada try to digest far-reaching U.S. demands to impose tougher minimum content requirements for autos built in the region. The Trump administration last week began a national security investigation into auto imports that could lead to new U.S. tariffs similar to those imposed on imported steel and aluminum in March.